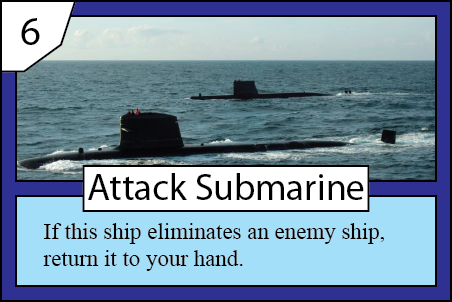 A new microgame is in development. Duel supports two players, each with a deck of 20 cards. 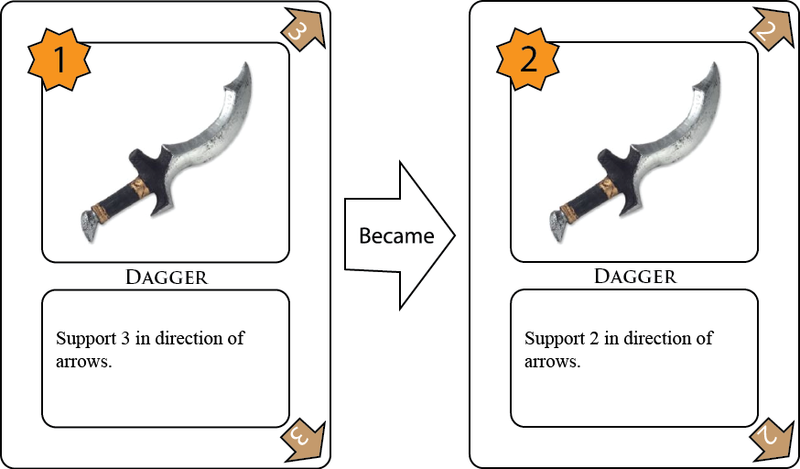 Players have a hand of 4 cards and may (1) play a card into an empty space, (2) play a card onto an enemy card, or (3) move a card one space. After this, the player refills her hand. The game ends if a player is down to 3 or fewer cards in hand and chooses to end it. The player controlling the majority of spaces in a 3×3 grid wins. Kevin (APE Games) Brusky has given the prototype a look and wants to proceed together. APE Games will release the game in two-player packs containing two unique armies. 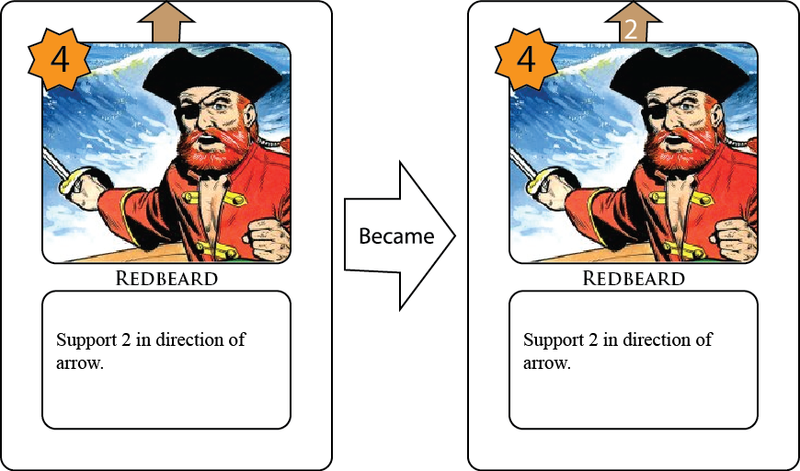 We have taken an extensive look at three decks–Pirates, Sea Monsters, and the Shogunate. Now we look at the Masters of Kung Fu deck who bring the Merge ability into the game environment. In the late 1980s, every Saturday night at midnight, right after Saturday Night Live, our local NBC affiliate ran Black Belt Theater. These beloved B-movies boasted bombastic titles like Kid with the Golden Arm, The Nine Demons, and The Invincible Armor. They frequently packed the entire hero’s journey into their allotted 90 minutes or less. I would argue that these movies even set the visual style for modern action masterpieces like Django Unchained, The Man With The Iron Fists and Tai Chi Zero / Tai Chi Hero. For years, I longed for an excuse to create a game in this high-flying setting. Developing Duel has given me just that excuse. 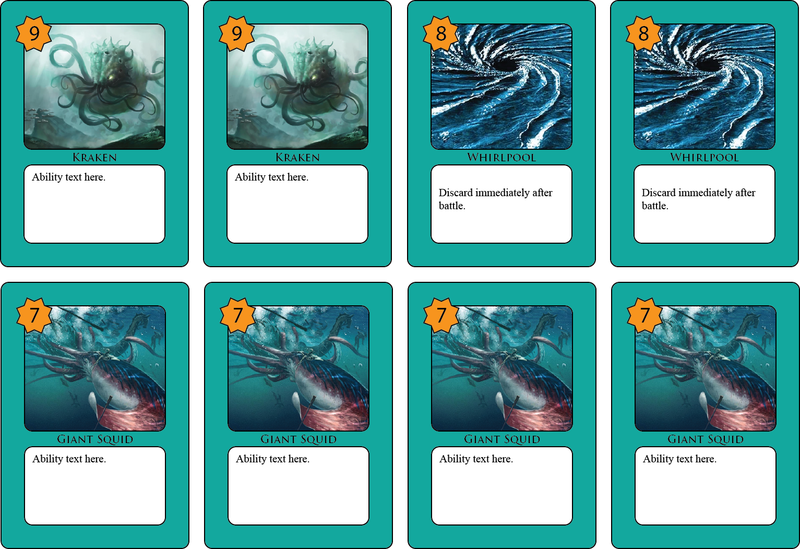 While this set is still in flux, its variety of card interactions has proven popular with playtesters. Unlike the Pirates or the Shogunate who tend to cover one another with their remote Strike abilities, the Masters of Kung Fu deck boosting through cards that directly enhance one another. 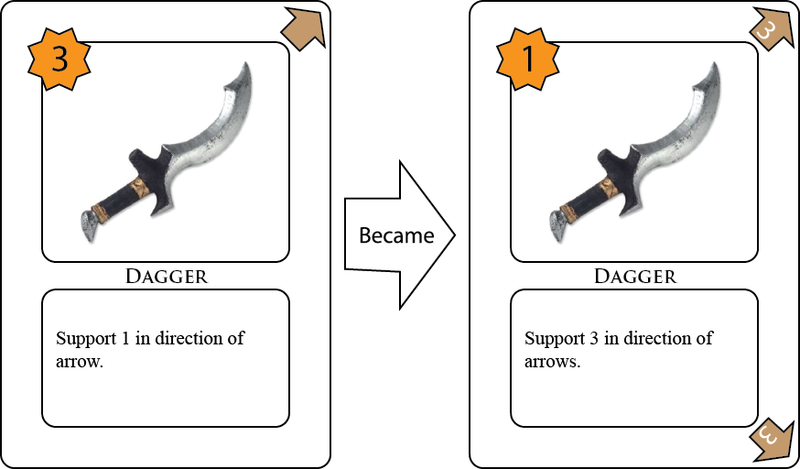 This theme is in the three Sword Sisters–Strength 6 cards which gain +1 Strength for each other Sword Sister in play. 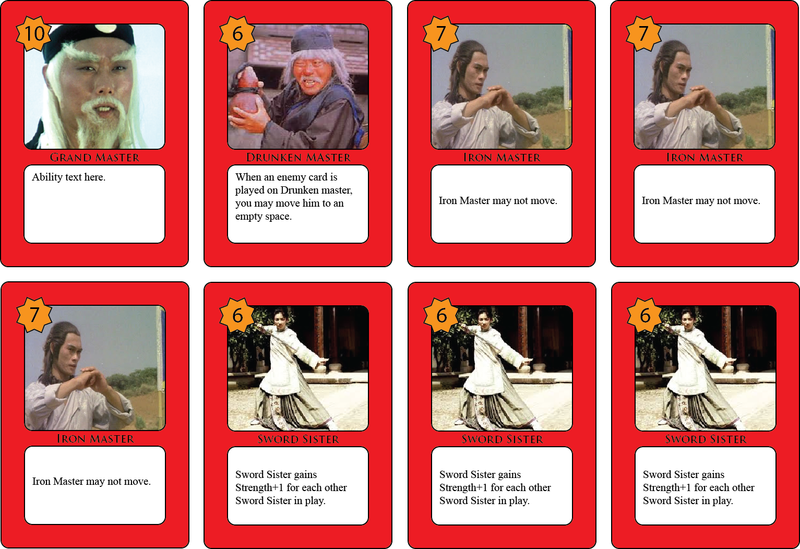 This theme is in the slippery Drunken Master–a slippery fighter who cannot be pinned down and can therefore jump to the assistance of a beleaguered ally. This theme is seen in the Flying Punch–a Coup de Grace that immediately returns to your hand. 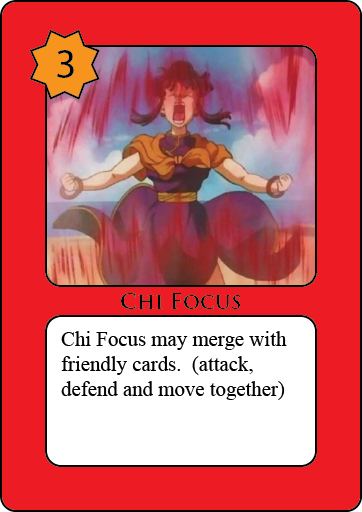 The card which drives this theme home is Chi Focus–the first appearance of the Merge ability–which can join another card, effectively increasing the strength of the original by +3. 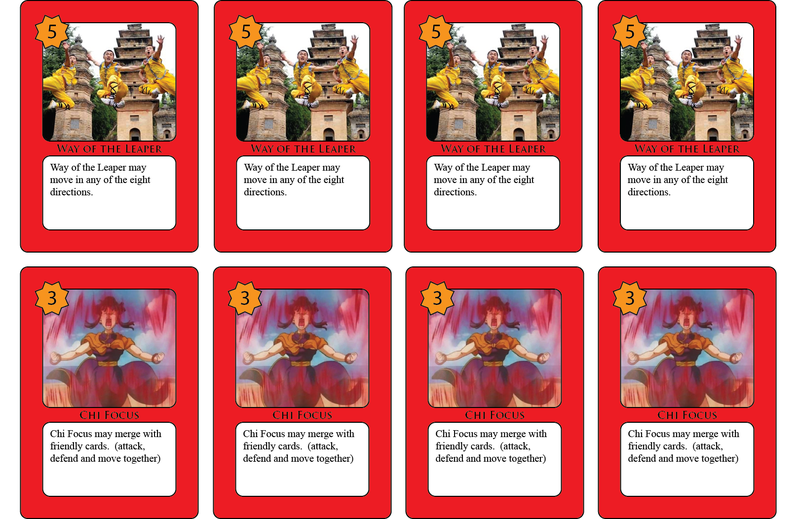 As of this writing, the Masters of Kung Fu deck is undergoing its first major overhaul. The Drunken Master was too powerful at Strength 8. In response, he has been reduced to Strength 6. 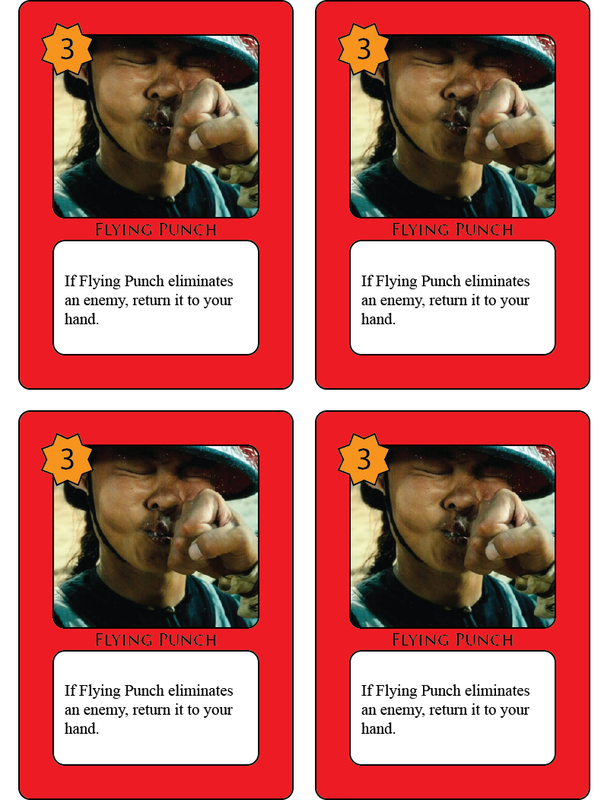 Flying Punch stands accused of being too weak since its low strength cannot hold any spaces on its own. We have a few possibilities being passed around–the most prominent among these being the simple addition of the phrase “you may.” No definite resolution has yet appeared however and the version given here is its original. As Duel enters its next extended playtest cycle, we depart from it here for a while. Our next entry in this column will take a look at one of the big buzz games at Gen Con 2014 and what it can teach us about triggered effects in a deckbuilding environment. To what game am I referring? You’ll find out next time! What’s your take on the Masters of Kung Fu? What do you find most intriguing about them? Which cards would you change? How would you approach them? Share with your fellow readers in the comments below. And if you’re enjoying what you’re reading, create an account with WordPress and follow this blog. You keep reading. I’ll keep writing. Kevin (APE Games http://apegames.com/) Brusky has given the prototype a look and wants to proceed together. APE Games will release the game in two-player packs containing two unique armies. 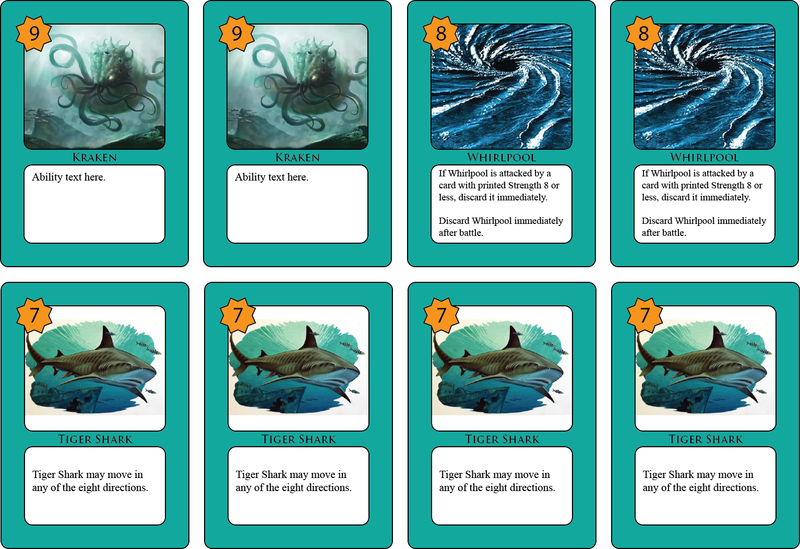 We have taken an extensive look at two decks–the team boosting Pirates and the lone swimming Sea Monsters. Each was created to focus on a certain part of the game. Now we look at the Shogunate deck and bring the Ally ability into the conversation. The “Support” ability has given many players issues. We have repeatedly seen them mistake this ability for a defensive boost rather than an attack boost. This is natural, considering the connotation of the word. To clarify, we ran through a list of replacements and came up with “Strike.” The rules have been updated accordingly. Close on the heels of the Pirates and the Sea Monsters were the Shogunate. This deck was conceived around the kind of large-scale battles we see in films like Akira Kurosawa’s Ran. And Ninjas. You gotta have ninjas. The Shogunate became an effort to blend elements from each of the previous two decks. 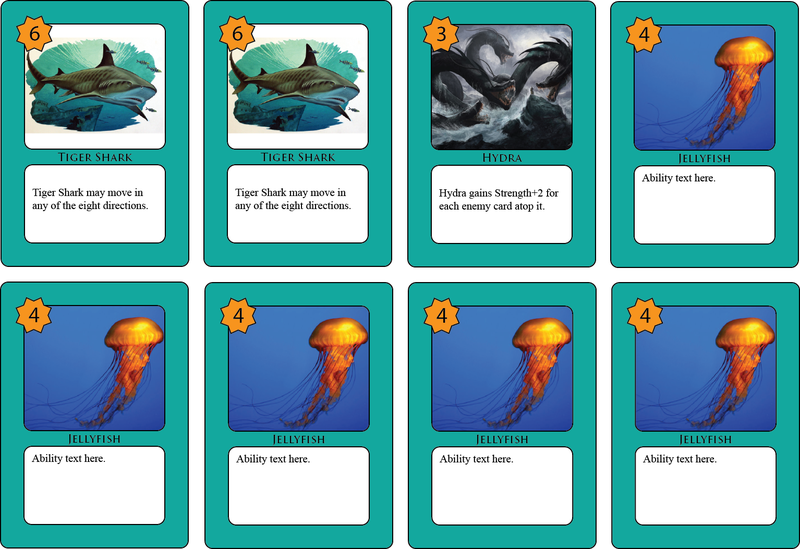 In this deck, we see the Ninjas equipped with a first strike ability akin to that used in the Sea Monsters. We see Archers with a Strike ability similar to that of the the Pirates. 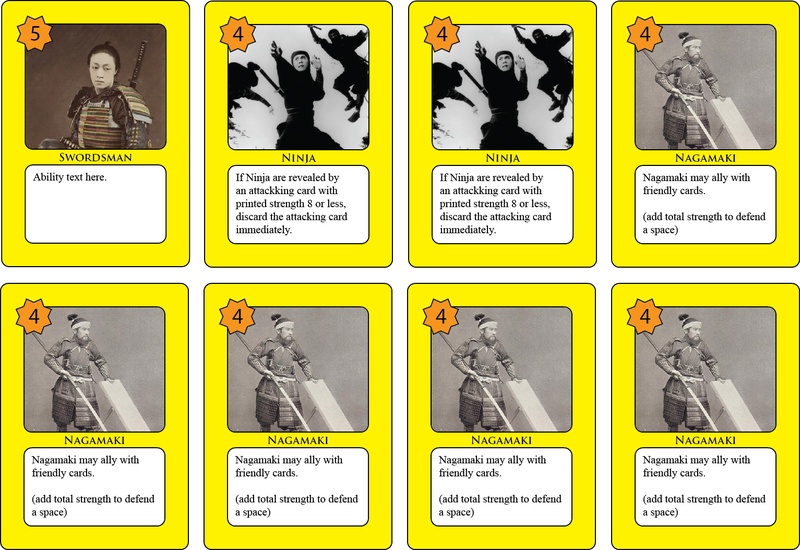 The Shogunate also feature the first appearance of the Ally ability–Nagamaki cards that can to add to the defense of a space. 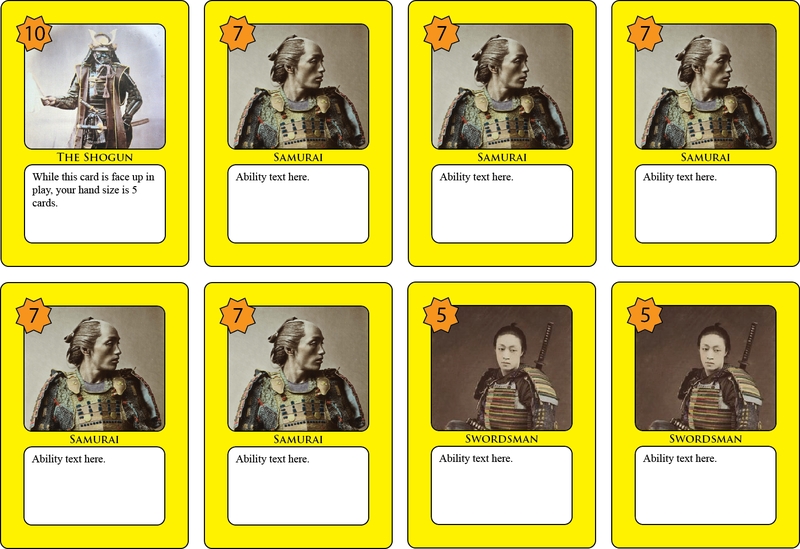 As of this writing, the Shogunate deck has been through three major overhauls. The Ninja were too weak at first, the Swordsman too strong. The version you’re seeing here has been testing well, however and I don’t anticipate any major changes any time soon. We’ll take a look at the Shogunate’s chief rivals next time when you’ll see The Masters of Kung Fu deck. How do these decks interact with one another? You’ll find out Friday! A new microgame is in development. Duel supports two players, each with a deck of about 20 cards. 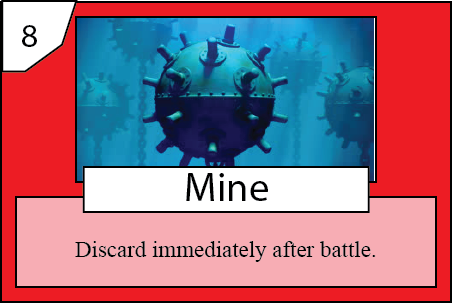 Players have a hand of 4 cards and may (1) play a card into an empty space, (2) play a card onto an enemy card, or (3) move a card one space. After this, the player refills her hand. The game ends if a player is down to 3 or fewer cards in hand and chooses to end it. The player controlling the majority of a 3×3 grid wins. Kevin Brusky has given the prototype a look and wants to proceed together. APE Games will release the game in two-player packs containing two unique armies. Iteration is the heart of design. Constant cycles of playtesting and tweaking sessions between each cycle are the best way to home in on something that is both balanced and fun. Throughout this test cycle, we’ve been using a randomizer (from random.org) has been used to set matchups. This data is helping us to identify the relative strengths of each deck. Because we’ve also used this randomizer to set the starting deck, we are able to look for any player order advantage as well. The last time we discussed the Pirates, they were being toned down a bit. We lowered the power level of both the Dagger and the Cannon. Since these changes came in, there’s been no need to adjust the deck any further. The Pirates are sailing high. 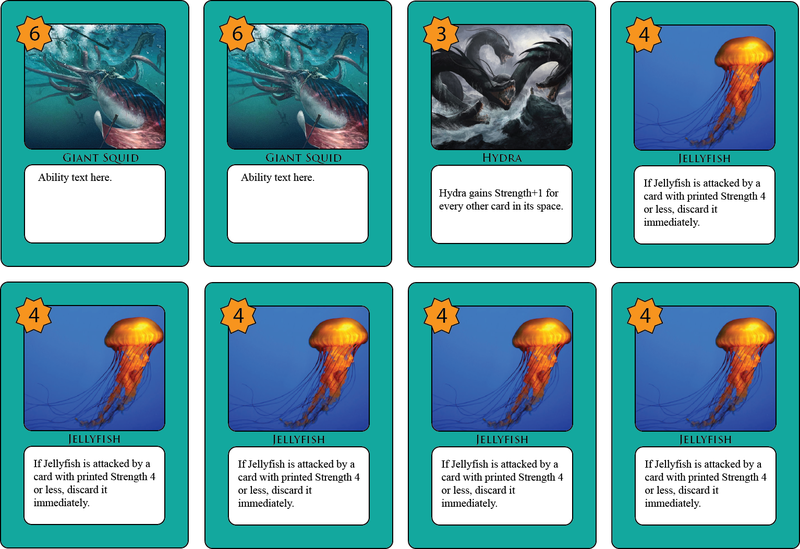 Recent testing indicated that the Sea Monsters had failed to keep up with the overall power level of the game. They were beefed up a bit but still fell behind in general. 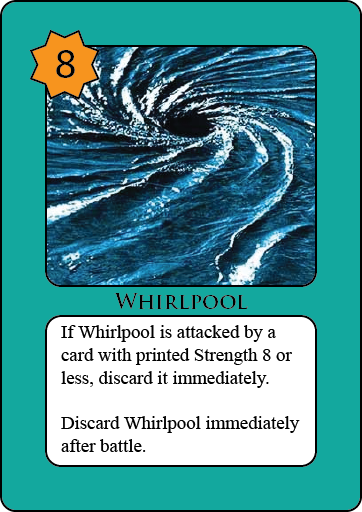 Even worse, one card–the Whirlpool–has been described as counterintuitive by players. 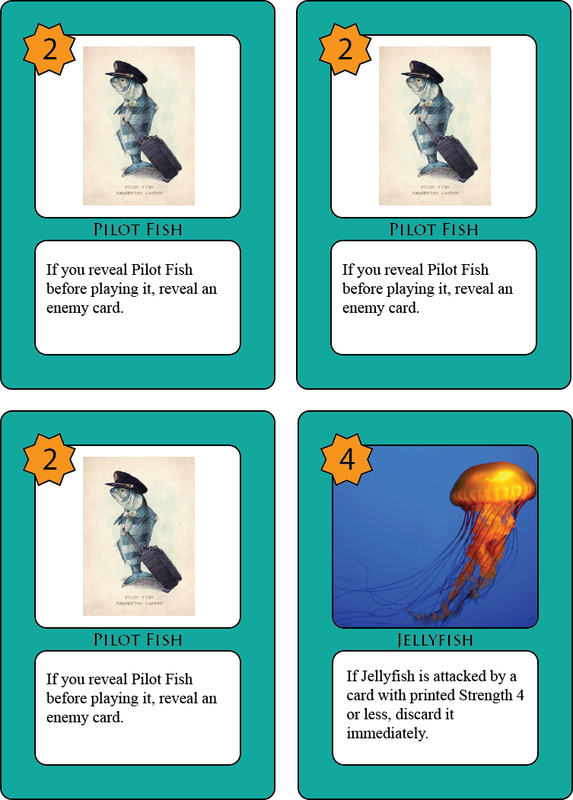 Our last iteration gave the Jellyfish a limited first strike ability. 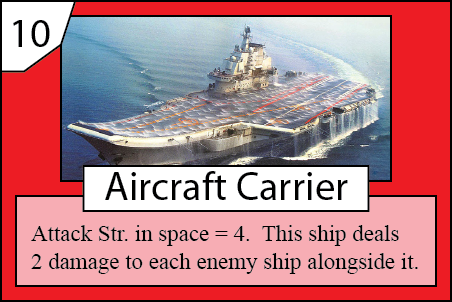 At the time, this first strike would immediately eliminate any card of strength 3 or lower, regardless of its position as attacker or defender. When this ability was conceived, I’d kept the option open to raise this threshold to Strength 4. This option has been activated and a similar version has been given to the Whirlpool. The biggest rule debate has hung on the ability to rotate revealed cards. 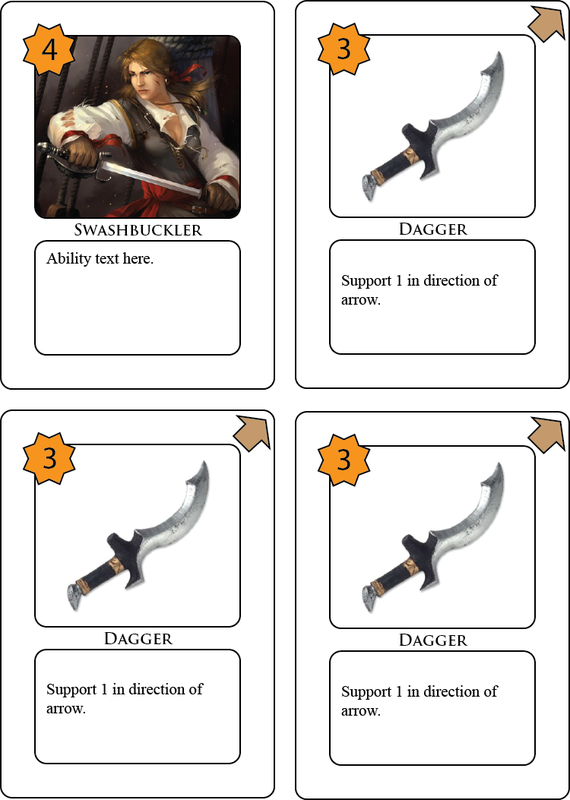 This rule matters quite a bit to the Pirates since their fiercest weapon is an array of support arrows. We tried playing the game both ways–first where rotation was allowed as an alternative to a normal move action, second where rotation was disallowed. These tests were met with mixed feelings. Some testers enjoyed the extra option. 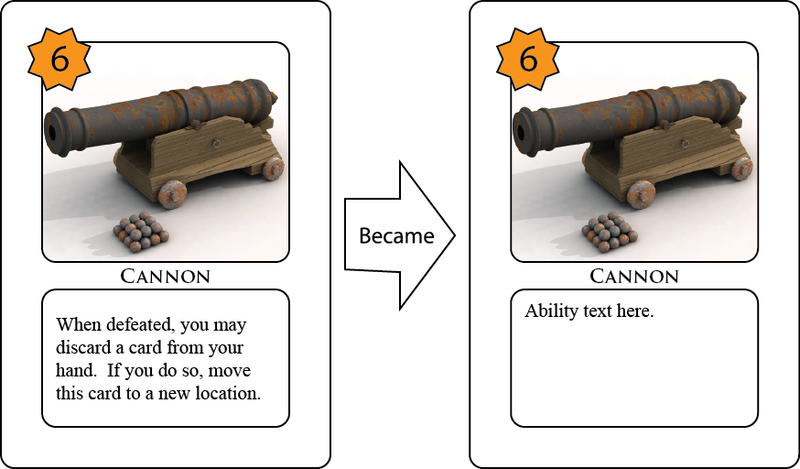 Others felt that the ability to rotate a card was a massive force multiplier. For the moment, I’ve elected to deny card rotation once revealed. Overall, Duel seems to be progressing well. Its core decks are focused but still interesting to play. Next, time, I’ll be posting another faction for your gameplay pleasure. Iteration is the heart of design. Constant cycles of playtesting and tweaking sessions between each cycle are the best way to home in on something that is both balanced and fun. 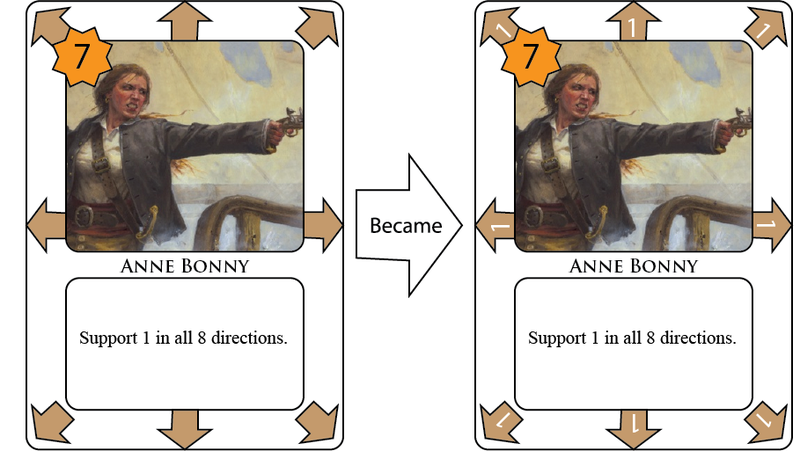 During the last cycle, the Pirates seemed to be underpowered and needed a boost. This cycle revealed that we’d gone a bit too far. 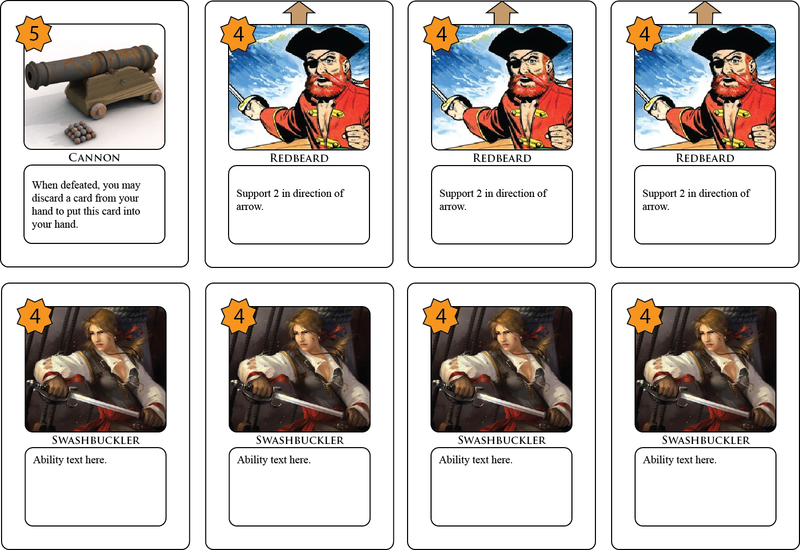 Our last column described how we powered up the Pirates. This cycle, the pirates showed themselves to be a bit too good. Specifically, the Pirate set went 6-0 against the Sea Monsters and two other decks as well. We need to turn the dial back a little bit. Before going too far down this road, I stepped back to reexamined the set’s theme. Reviewing Part 4 (), reminds us that the main categories of card ability are (1) Teamwork, (2) Individualist, (3) Movement, and (4) Card Manipulation. The Pirates are meant to be individually manageable but strong in combination–teamwork. It was for this reason that so many of their cards feature support. What we have learned along the way is that support can be a major force-multiplier. Its strength needed to be toned down a little bit. Our other major discovery related to the Cannon. raising its strength by that little +1 and allowing it to be replayed immediately made it wildly overpowered. It had become a threat too big to ignore but also impossible to get rid of. Adding insult to injury, trying to eliminate a Pirate Cannon actually helped the Pirate race through his deck, leaving you less time to respond. Our solution was to shelve this ability and strip the card back. 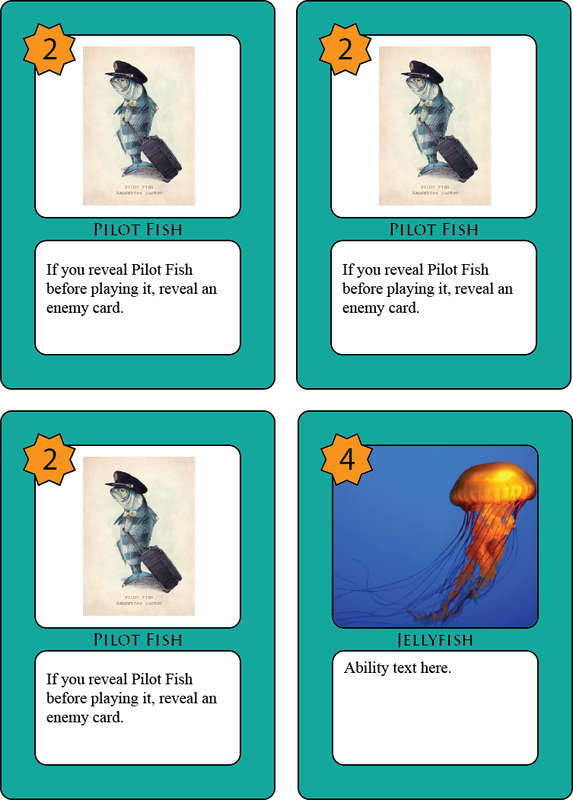 The Sea Monsters seemed to be about right when played against the first draft of the Pirates. As the Pirates were refined and other sets created (you’ll see some of those soon, I promise) it became clear that the Sea Monsters had failed to keep up with the overall power level of the game. I again stepped back to reexamine the theme of the set. The Sea Monsters were meant to be individually strong with limited combinations. They were something more of a brute force deck than a support deck. Perhaps this was the wrong concept. 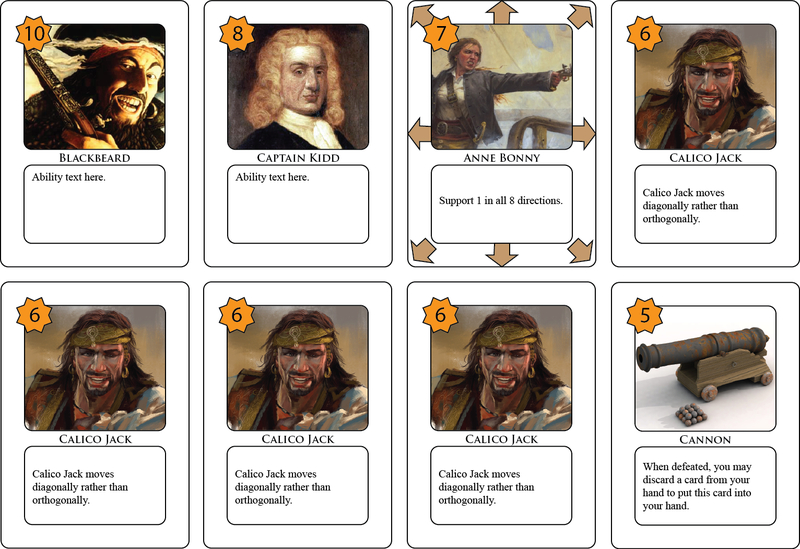 Remembering that the Pirates push teamwork heavily with their extensive use of support cards and have a dash of movement in Calico Jack’s diagonal movement. Let’s make the Sea Monsters push individualism and movement more heavily. 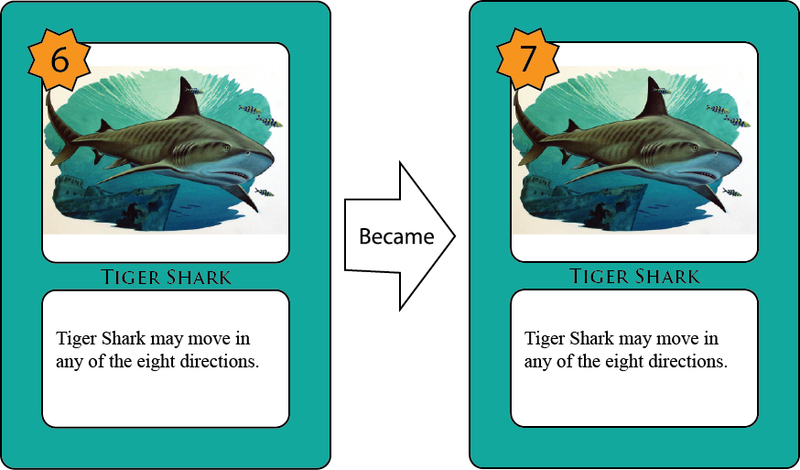 In the area of movement, we already have the Tiger Shark but with strength 6, it seldom gets a chance to really roam the board the way it wants to. We decided to raise its strength to 7 and to have four of them in the deck rather than just two. 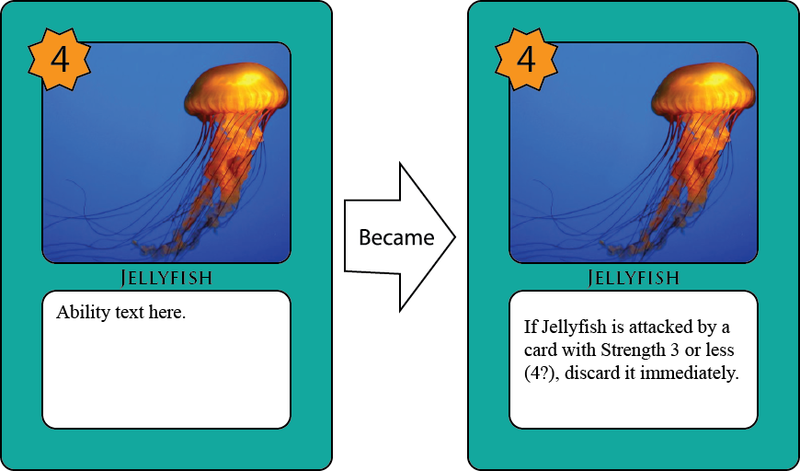 In this ways, a beginning player will have many more opportunities to interact with this mechanism. 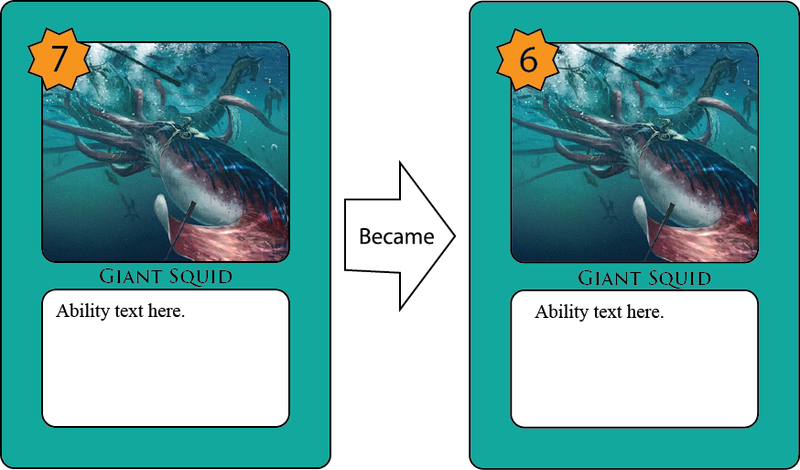 To rebalance the deck, we reduced the strength of Giant Squid down to 6 and now only have two of them. 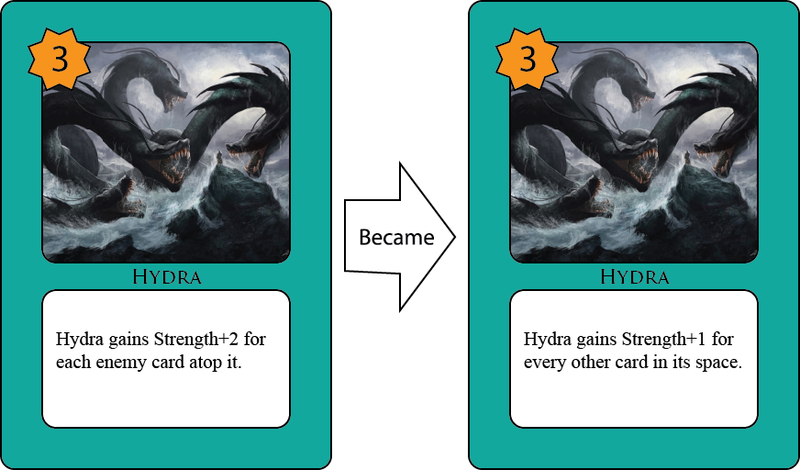 The overall notion behind Hydra was sound but putting it on the defensive limited its play. We gave it more options. 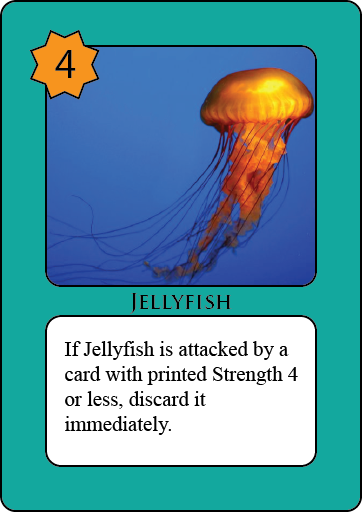 To fully round out the individualist theme, the Jellyfish got a little boost–a first strike ability. The “4?” in parentheses indicates that this stat could go either way and is actively being considered. Rules like these are frequently included on prototype components to encourage playtesters to keep an eye it and weigh in as we play. All this testing also prompted a few rule changes. Most notably, we’re testing the idea that in the case of a tie, the attacking card wins and claims the space rather than being eliminated along with the defending card. This change tends to keep the board more full and give players a bit more to wrestle with but also makes the closing moves of the game richer and more exciting. Next week is the Protospiel main event in Chelsea, Michigan. This is the best event for design of all those I attend. Organizer David E. Whitcher puts on a solid event, filled with the most helpful folks you’ll ever meet. Come on down–I’ll see you there! And while you’re prepping your games for the event, be sure to check out our columns on what to expect. Just follow these links toPart 1, Part 2, Part 3, and Part 4. Their first playtests revealed that opportunities for improvement. This is perfectly natural. If anything, I would have been more worried had we failed to. Interestingly, the Sea Monsters set seemed to perform well just as it was. It is in the Pirate deck that work was most needed. I seldom worry over the beauty of a prototype. Functionality is a different issue, however. We found that players often had trouble quickly remembering each a given card’s support strength. For this reason, numbers went into the arrows as a reminder. 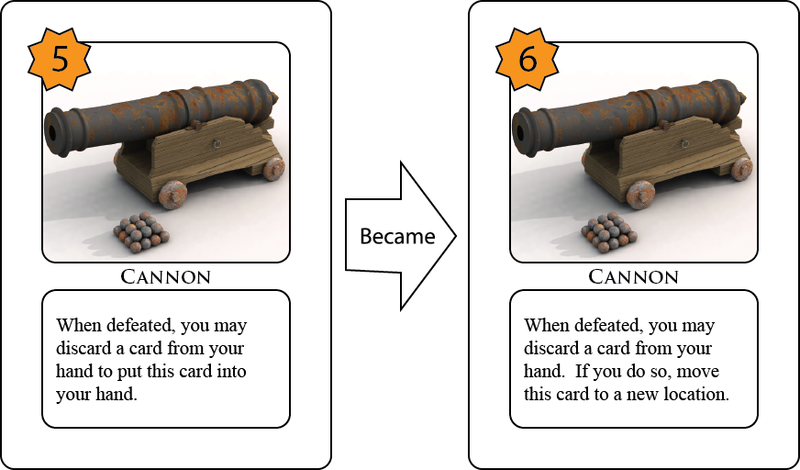 The cards Dagger and Cannon were both seen as an interesting ideas but in need of adjustment. In the case of the Dagger, its support simply wasn’t strong enough to matter in most battles while its Strength was low enough that it could be easily eliminated from the map at the opponent’s whim. Its low strength was the lesser issue since low strength cards can be particularly useful for pinning down large cards so they couldn’t move. That meant that its support was the real issue. My solution was to boost its support while lowering its base strength. The intent here is to focus the card more heavily on its role as a support card rather than as a direct attack card. The Cannon suffered from similar Strength-related issues. With its marginal Strength 5, there weren’t so many cards worth discarding to reclaim it, particularly since doing so gave your opponent insight into your hand. We boosted its strength from 5 to 6 and made its power replay the cannon immediately. This means that the Pirate player would have to play short-handed on his next turn in exchange. We see potential for this to be an interesting decision point in the game. Playtesting will obviously be needed before we will be sure. 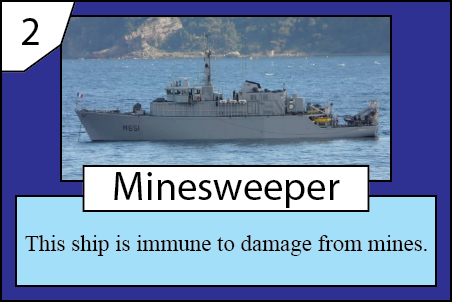 On your turn, you may Concede a battle in which you are the defender. Discard all cards in this battle apart from the topmost enemy card. That card remains to take ownership of the space. You may do this as many times as you wish, in addition to your normal action. We don’t expect to see this rule invoked often, but if it does its job at critical moments of play, if it creates opportunities for skillful play, it will be carrying its own weight. Next week is the Protospiel main event in Chelsea, Michigan. This is the best event for design of all those I attend. Orgainizer David E. Whitcher puts on a solid event, filled with the most helpful folks you’ll ever meet. Come on down–I’ll see you there! And while you’re prepping your games for the event, be sure to check out our columns on what to expect. Just follow these links to Part 1, Part 2, Part 3, and Part 4. Card abilities have been categorized into five broad groups–teamwork, individualist, movement, card manipulation, exotic. It is time to start codifying the rules and creating decks. I like to get rules written down as soon as possible no matter what sort of game is being developed. These rules will get overhauled from time to time but they are a good progress marker nonetheless. For reference, here they are in toto. Their first playtests revealed that these decks were not fully balanced. This is perfectly natural. If anything, I would have been more worried had we failed to find any areas for improvement. Iterative play with a steady stream of adjustments has and always will be the secret to game development. We’ll take a look at where the imbalances appeared and how we adjusted the game in response to those imbalances next time. See you Friday!